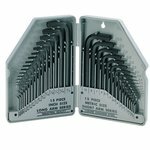 Hex key sets catalog with a wide range of slots of different sizes. These sets are presented in both the metric system and in inches. Besides, there are folding sets. 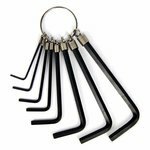 Nine extra long arm ball point hex keys. 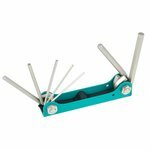 Useful for many applications because of different tip sizes and opportunity to work in narrow spaces. 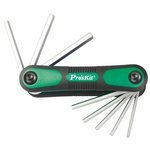 Hex key set Pro'sKit 8PK-027 with comfortable long arms is designed both in metric and inch size. 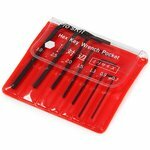 Nine hex keys Pro'sKit HW-129 with comfortable long arms are useful for many applications because of different tip sizes. 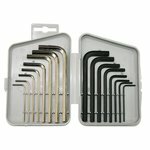 Eight hex keys Pro'sKit HW-121M would be useful for many applications due to different tip sizes. Material: SAE6150 chrome vanadium steel. 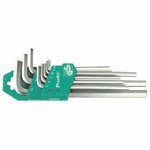 Seven miniature allen wrench set Pro'sKit 8PK-022 with comfortable long arms are useful for many applications because of different tip sizes. Finish: case-green lacquered key-sand blasted + nickel plated. Content: 1.5, 2, 2.5, 3, 4, 5, 6 mm. Material: SAE6150 Chrome vanadium steel. 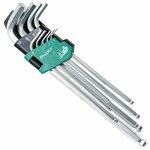 A set of nine hex keys with comfortable long arms. Useful for many applications due to different tip sizes. 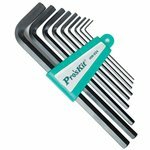 Pro'sKit HW-023 is a set of eight hex keys with a convenient ring and comfortable long arms. Useful for many applications due to different tip sizes.